One of my favorite things to eat growing up was grilled cheese. Especially on a cold, rainy day or when I was sick. Even now that I'm older, if I stop by my parents' house during the day one of the first things my mom will do is ask if I'm hungry. If I say yes, grilled cheese is still always one of the first things she offers to make me. She knows how much I love it and I just can't say no! But it has to be paired with a hot, steaming bowl of tomato soup. There's nothing like dunking a crispy sandwich into it. I wasn't feeling too well the other day and wanted some comfort food. 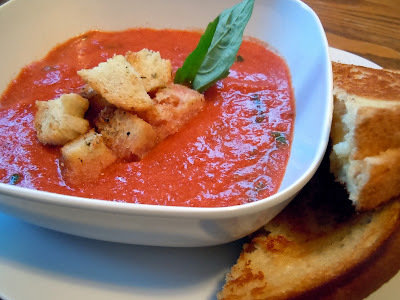 I made myself a grilled cheese sandwich and then I decided to take a crack at homemade tomato soup to accompany it. The recipe looked pretty easy, so I didn't really think it would interfere too much with my pounding headache or dripping nose. Good thing I was right. I topped it off with some homemade Parmesan Croutons and it was del-i-cious. I think my cold cleared up right away, too. Enjoy! In a large saucepan, bring the tomatoes and broth to a boil. Reduce heat; cover and simmer for 10 minutes. Add basil and sugar. Reduce heat to low; stir in cream and butter. Cook until butter is melted.